Talks in the university pension dispute resumed at noon on Tuesday after overnight skirmishes on Twitter. Talks had been suspended until Wednesday after Monday's meeting at the offices of the conciliation service Acas ended without agreement. Staff at 64 universities say pension cuts will cost them an average £10,000 a year, but the employers say the scheme has a deficit of more than £6bn. Over 126,000 students have now signed petitions calling for fee refunds. Students are reported to have occupied campus buildings in support of striking lecturers at nine universities over the past two weeks. The National Campaign Against Fees and Cuts says this is the biggest wave of occupations since 2013 and claims it includes Bristol, Leicester, Bath, Exeter, UCL, Sussex, Southampton, Liverpool and Reading universities. However, Southampton rejected claims that students who met the university's vice-chancellor last week had occupied a building or blocked an entrance. The employers' organisation Universities UK wants the Universities Superannuation Scheme to change from a defined benefit scheme, giving members a guaranteed income in retirement, to a defined contribution scheme, where pensions are subject to changes in the stock market. On Monday the two sides discussed an alternative proposal tabled by UCU at the first round of talks last week. The union says its plan would involve universities accepting some increased risk and small increased contributions from employers and scheme members. On Twitter, UUK said more time was needed to cost the union's proposal which it feared would require "very substantial increases in contributions". However, some vice chancellors have voiced support for UCU's plan. The union blamed UUK for the delay but they said they were prepared to meet "any time, any place for talks". Interchanges between UUK and academics on the social media platform overnight resulted in a new round of talks, starting at midday on Tuesday. On Tuesday morning a UCU spokeswoman said: "We are not interested in the game playing, and welcome the fact that they have now agreed to more talks today." 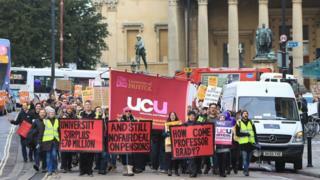 University strike: What's it all about? With a further seven days of strikes due to take place before the end of next week, UUK wants industrial action called off while talks continue. Last week universities minister Sam Gyimah urged institutions to offer compensation to students for teaching hours lost during the dispute. The dozens of petitions calling for refunds are largely supportive of the strikers. Kings College London has said it will ring-fence any salary savings as a result of the strike action as a fund which it would use to offset the impact of the strike on students. A spokeswoman said it was too early to say whether this would mean refunds for all students or a contribution to the student hardship fund.